SPECIFICATION INCLUDES:- 6-SPEED MANUAL TRANSMISSION, X50 POWER PACK, METALLIC PAINT, FULL NATURAL LEATHER INTERIOR, PORSCHE COMMUNICATION MANAGEMENT WITH TELEPHONE, CLIMATE CONTROL, ELECTRIC SUNROOF, HEATED ELECTRICALLY-ADJUSTABLE SEATS WITH DRIVER MEMORY, 18” SPORT TECHNO ALLOY WHEELS WITH 17MM SPACERS, ALUMINIUM LOOK INTRUMENT FACES, ALUMINIUM & LEATHER GEAR KNOW AND HAND BRAKE LEVER, STAINLESS STEEL DOOR ENTRY GUARDS, LEATHER COVERED IGNITION LOCK SURROUND, BOSE SOUND PACKAGE, 6-DISC CDC-3 CHANGER, REAR PARK ASSIST, XENON HEADLAMPS, TOP TINTED WINDSCREEN. This 996 was the 6th incarnation of the infamous Porsche 911 and its Turbo variants. 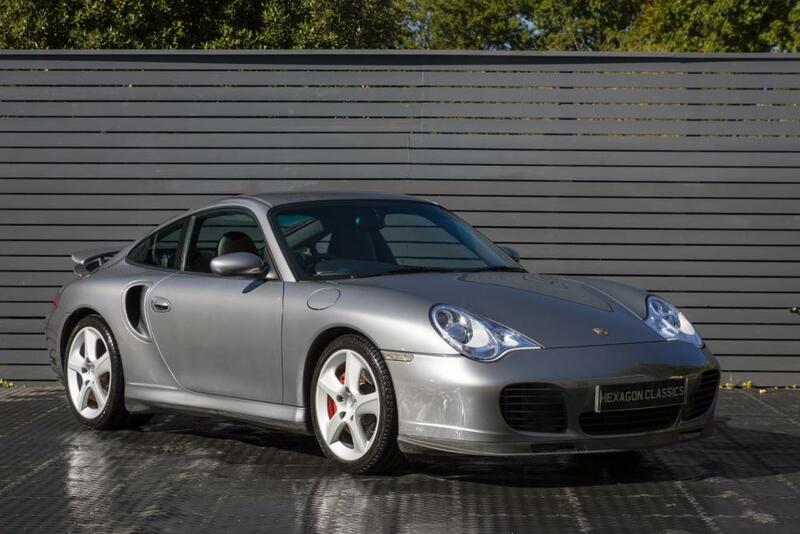 Very few 996 Turbos were sold with manual gearboxes, and even fewer had a factory-fitted X50 power pack which is why we are delighted to offer this car here Hexagon Classics. The 996 Turbo had a 3.6 litre engine, with twin turbochargers, and was water cooled, which brought power up to 420 BHP. 0 to 60 mph therefore only took 4.2 seconds which was cut further to 3.6 seconds with the addition of the X50 package. A highlight of the car that was also necessary due to its performance capabilities were its brakes. The system, designed to withstand extreme punishment, featured four-piston monobloc aluminium fixed calliper brakes with 330 mm cross drilled internally vented discs, four channel ABS and a 10″ vacuum brake booster. Braking from 60 to 0 mph took just 2.4 seconds. The X50 power package option increased the BHP to a staggering 450, which prompted BBC TV’s Jeremy Clarkson to comment at the time, “It hurts me to say this, but of all the cars you can buy today, this is the best.” The maximum torque figure rose to 457 lb/ft. Compared with the previous 993 Turbo model, the 996 represented a virtual redesign. Cosmetically, it moved Porsche on in many significant yet subtle ways: the lines were smoothed out, the windscreen was raked back, the cabin was roomier, and the facia finally looked like it had been styled. The structure managed the neat trick of being 45 per cent stiffer yet lighter than the older model. The chassis and brakes are a perfect match for the engine’s performance. This car is presented in presented in immaculate condition and must surely be one of the lowest mileage and best examples available today. This car represents a fantastic opportunity and is available for immediate viewing at our London showroom.